I love a great salad that is QUICK and easy to make. I am always rushing out the door in the morning to get to work on time after squeezing in my morning Pure Barre class; so I need something that was already made the night before or something I can literally throw together in five minutes or less. I have two go – to salads these days that are packed with flavor and nutrients and keep me full all afternoon. 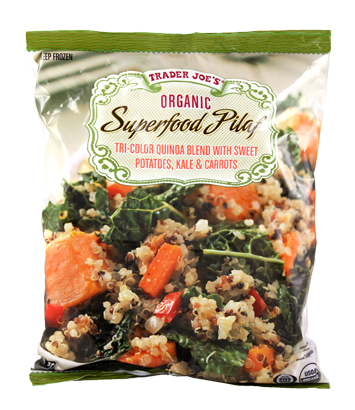 I don’t often buy frozen/prepared foods aside from veggies or fruit, but this superfood pilaf from Trader Joe’s recently made its way into my grocery bag and I have to say… it was awesome! It not only tasted great, but it made for a super-easy quick-fix to dinner and lunch, especially considering we haven’t been able to get out much for fresh produce (thank you snow…). Great recipes!